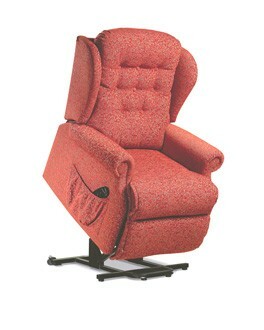 Riser Recliner Chairs in Staffordshire, Cheshire, Derbyshire & Shropshire. 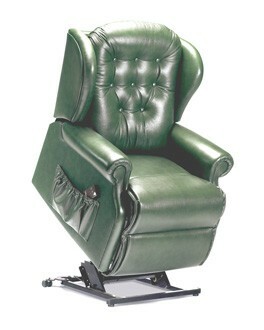 AVAILABLE FOR IMMEDIATE FREE DELIVERY - A HUGE STOCK OF RECONITIONED AND EX- DEMO RISER RECLINER CHAIRS FROM £295. OLD CHAIR REMOVED. 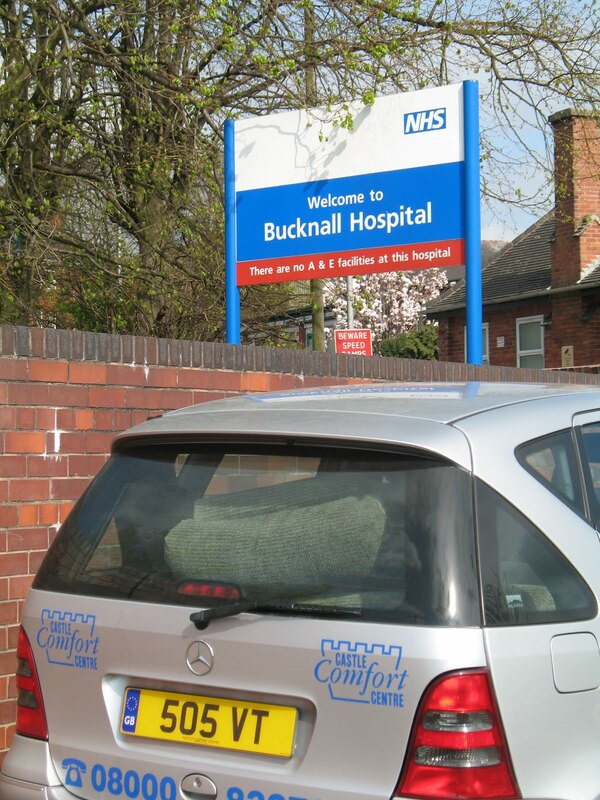 If you are looking for an electric bed or riser reclining chair literally anywhere in the UK, but especially in Staffordshire, Cheshire, Derbyshire and Shropshire - then you have found the best mobility products specialist. 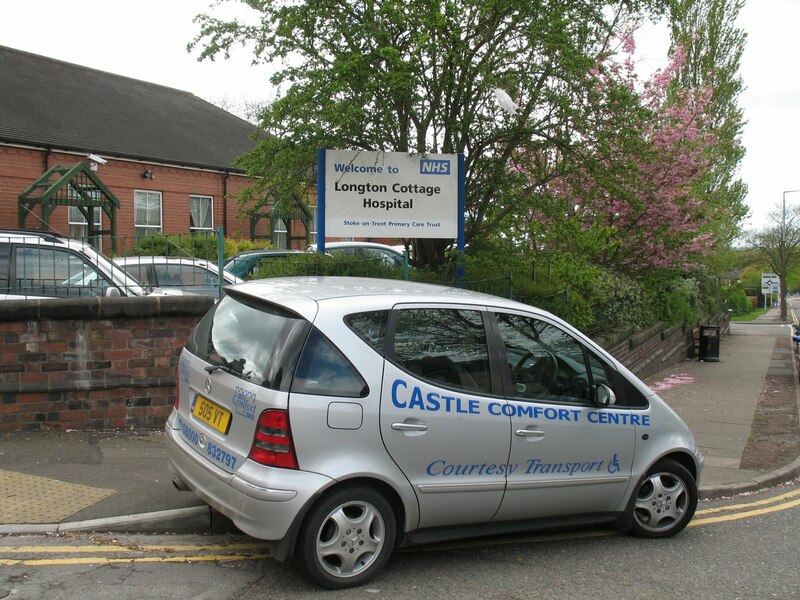 A short drive away, between Junctions 15 and 16 on the M6 you can come to Castle Comfort - park right by the door and try the best range of adjustable chairs and beds that exists. And at great prices. Also while you are in the Stoke on Trent area - why not combine your visit with an hour at Trentham Gardens? or if the grandchildren are coming with you - why not lose them for a while at AltonTowers? Riser Recliner Chairs, or 'riser recliners' as they often referred to, a few years ago could cost literally £££thousands.... and still can - that is if you contact the wrong people. Years ago, Keith Simpson, seen here with co-director Ann Bruce and Dr Neil Stirling, became the founder of what was to become a major UK supplier based in Staffordshire of the product. It all began at this historic building at Wolstanton, Newcastle under Lyme, Staffs, where Castle Comfort created its headquarters. And here, inside 'Bank House' today, are seen just some of the huge selection of riser recliners available. These days, inside this former branch of Nat West, you will hear in the conversation, the word hundreds - not thousands. Click on photo to enlarge Keith came across the idea purely by accident, when his late mother, Doreen, asked the big firms advertising on the TV and in newspapers, for information. Commission agents always cause things to cost too much. Many firms wanted to do a home presentation which could last hours - bringing to the prospect, who could often be alone and vulnerable, a cake or a bunch of flowers. This exploitation still goes on today in the mobility products business, and even finance facilities are offered. See our SPAM feature here in the stair lifts blog. 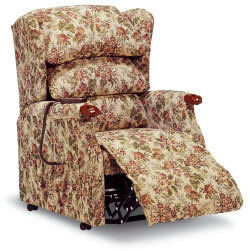 A riser recliner was obtained for his mum through contacts who imported them from America. Realising that the top quality 'Comfort Chair' could be obtained and bought and sold for just £495 - the enterprising Simpsons - with mum as company secretary, started Castle Comfort Centre at Newcastle under Lyme, Staffs, adjacent to Stoke on Trent. The company then went on to be a leading providers in the UK and Spain of stairlifts - for information on that subject please just ask. But the core business of chairs just went from strength to strength. Many people come to visit our Nottingham factory to see some of the companies fantastic products being manufactured. What is a riser recliner chair? You will see lots of them on the main Rise Recliner website and Stoke City and Eire legend Terry Conroy, who is patron of Castle Comfort's good deeds fund, just loves to test them - Terry has a had some bad luck health-wise recently (March 2011) but after major surgery, is now home and bit by bit on the way to a full recovery. It sounds like the University Hospital in Stoke on Trent have done a fantastic job. 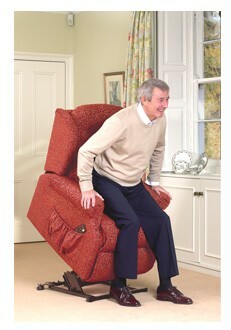 We hope the Castle Comfort Chair that he has kindly demonstrated himself for us so many times - will help him a little! Good luck TC !!! and get well soon - If you can make it to Stoke's forthcoming Wembley appearances(s) - you'll hear an even bigger roar for you from the fans, than when you popped in that goal in 1972! Now, before we go any further, please spend a few moments to enter a simple competition, and your correct entry will produce £10 for Cancer Research...... You can see a film of a Riser Recline chair working here demonstrated by a member of the Castle Comfort team. You will find this lady and her name on one of the group's other websites - and if your can spot her - and therefore name her ... we'll give £10 immediately to a very good cause. Send your answer to - infol@castlecomfortcentre.com and your effort will be acknowledged on the following Just Giving site. Or you can use the reply coupon here. And if you wish, please let us have your postal address so a copy of next year's company calendar can be sent. The fairly modern invention of the RISER RECLINER chair has helped hundreds of thousands of people world-wide to overcome mobility problems. Being around for only a quarter of a century - many terms apply to the product. 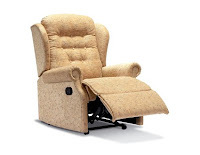 eg mobility chair, disabled chair, for the elderly or infirm, pride chair, chair to get you up - the list is endless, though the term 'riser recliner' is probably the most popular. However, the official term of this product - that is to say Oxford Dictionary and Wikipedia-wise - has not been decided. Therefore, have a look at our other Rise Recliner blog here - and you may win £100 ! Prices range from £3,500 - what ?????? ... wait a second .. to £295. That second figure has brought a sigh of relief! 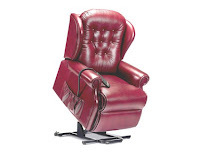 Yes indeed, one of the most popular chairs ever brought to the UK by this Staffordshire company has been the Spanish Massage Therapy Chair manufactured at the factory in Alicante. 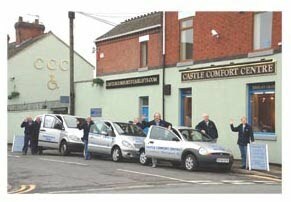 See full details on page 4 of Castle Comfort's own newspaper here. Prices can go to £3,000 plus, for a fantastic piece of therapy equipment that provides actual and genuine massage programmes - not simply vibrating cables that many so called 'massage chairs' have. Former PM Mr Blair has got one! His wife bought it for him so Tony would not need the continuing services of a blond Swedish masseuse. Believe us? Well the stair lifts cartoon site here has immortalised the tale. However, with a selection of reconditioned, (but guaranteed and delivered free) chairs starting from £295 - there are budgets for everyone. 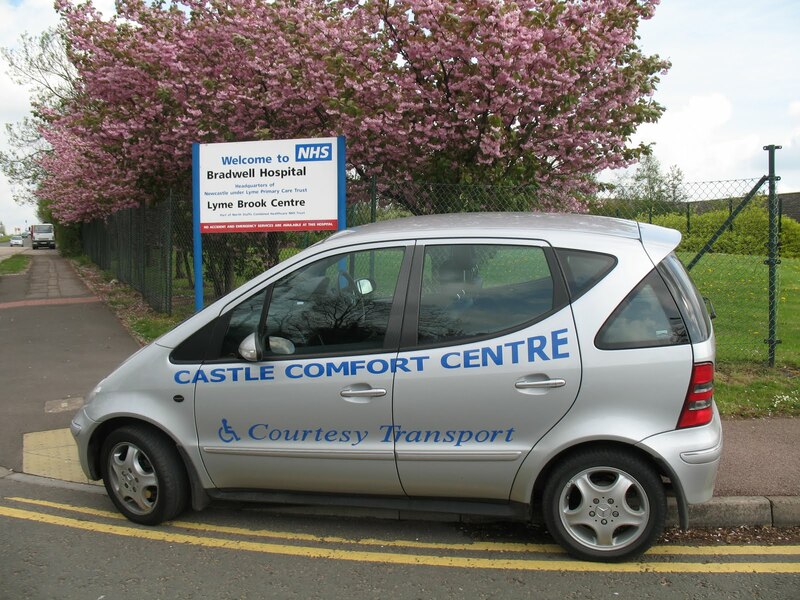 Castle Comfort will even remove your old chair or take it, without charge to the nearby home of a neighbour or relative. Many thinking of a new chair have no way of getting to the Newcastle under Lyme showroom, and whilst several chairs can be taken out to try at home - a better option may be to use the free courtesy vehicle, which will collect you - bring you to try all types of chairs, and take you home. All without obligation. If you live away from the Stoke and Newcastle Staffs region this is not a problem. 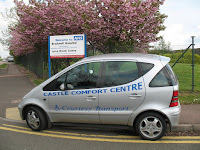 Delivery of many chairs is usually immediate and always without additional cost if within an hour’s drive of the Castle Comfort Headquarters at Newcastle under Lyme, Staffordshire which is adjacent to Stoke on Trent. 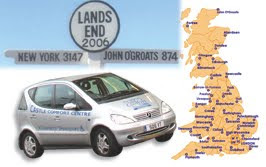 In practice – with delivery vehicles out daily as far north as Manchester, to the east - Nottingham, on the west Shrewsbury, and in a southerly direction – Birmingham, the company rarely ask for delivery fees. A fleet of loan riser recliners is always available to rent, so if a chair is needed for a short period - or perhaps someone needs convincing that there is nothing to fear from one - and if a trial period will help - then that's the answer. On a separate note - if anyone wants to trial the legendary transit chair - click on the blue writing here and one of our small lightweight wheelchairs can be brought out with your riser recliner. But maybe one of .... these ! Have a look, much more economical. Once having supplied products to new or existing clients, nothing pleases directors Ann and Keith and of course Doctor Stirling when people go to the trouble of saying ‘thank you.’ Letters of thanks are frequent and always much appreciated, but one in particular touched the hearts of all at Castle Comfort. Mrs Lilian McCormack, of Newcastle under Lyme, originally from Scotland, spent most of her life in Staffordshire. She had been a client of Castle Comfort for many years (as well as a patient of Dr Stirling) and one Sunday morning the lady received nothing more than the normal service. 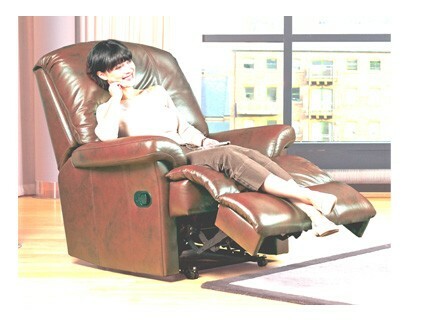 Her recently purchased leather riser recliner had developed a rare fault. So she was, within an hour of her family’s SOS phone call, given a brand new one. Even unknown to her caring relatives, she then took the trouble to write to the Stoke Sentinel newspaper with a comment. See her letter here. The lady was seriously ill at the time of writing, and indeed sadly passed away just a couple of days later. All can be said now, by Castle Comfort, is ‘thanks to you Lilian, it was a pleasure to do what we could.’ Finally, meet Ann and Keith, the controlling directors of the Castle Comfort Group, here along with Doctor Neil Stirling, the company’s ever involved ambassador and Head of the ‘Good Deeds’ fund. Please take a look at 'Dr S's own special website Followers of this story, if they don't already know Dr Stirling, will be delighted to lean more in due course. Any one of this ‘comforting trio’ will be pleased to hear from you at any time. Tel - 0800 0832 797. Email - info@castlecomfortcentre.com Or use the coupon. Bye for now.